Many Mount St. Mary's University students, faculty, staff and alumni will be watching the national midterm election night coverage on November 6 with Towle's Guide to Watching Election Returns for 2018 in hand. Political Science Professor Michael Towle began writing this guide for his Parties and Elections course more than 20 years ago. Over time, his readership has grown as word about this labor of love has spread. "My goal is to educate, generate discussion about the processes of American politics and to have some fun," Towle writes. "Some years, I have done very well in my predictions. In other years (like 2016), there were outcomes that I didn't see coming." Towle's guide includes an explanation of how the television networks and The Associated Press often determine the winner of elections before all the votes are counted as well as a look at the effect of early voting in some states. He also provides advice on which races to watch earlier in the evening for indications of a Democratic "wave" or a Republican "seawall." After offering an explanation for his reasoning, Towle predicts that the Democrats will gain 31 seats in the House of Representatives and will control the House by a margin of 226 to 209. He offers a prediction for each of the 35 Senate races, forecasting that seats in Arizona and Nevada will switch from Republican to Democrat control and North Dakota will move from Democrat to Republican. Under Towle's predictions, the Senate will be divided 50-50 with Vice President Mike Pence as the deciding vote to maintain the Republican majority. 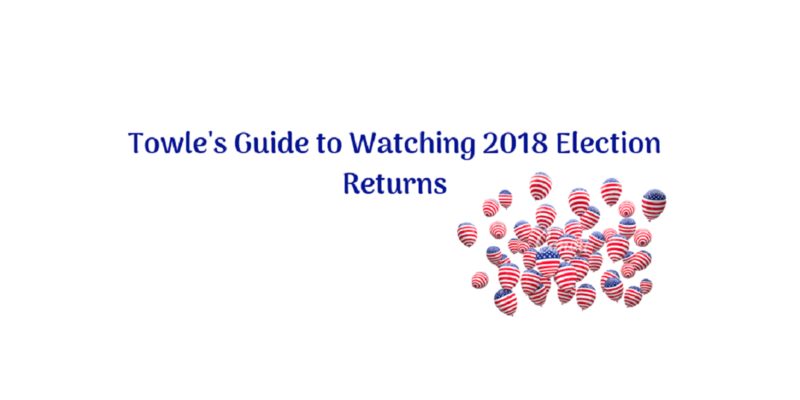 Make sure you have Towle's Guide to Watching Election Returns for 2018 with you as you watch midterm election coverage on November 6.